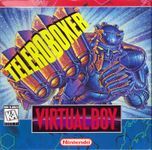 ""Teleroboxer (テレロボクサー) is a game for Nintendo's Virtual Boy video game console. The game is a boxing simulator played in the first person view."" Source: Wikipedia, "Teleroboxer," available under the CC-BY-SA License.